Canadian tenor Jamie McLennan has a video blog. As he puts it, “It’s just me, my iPhone, a $40 mic and whoever I can grab to work the camera.” Below you can see him at work during rehearsals of Verdi’s Falstaff in Hamilton(*). It’s worth watching just to see Sasha Djihanian twerking. (*)For non Canadians, Hamilton, ON is a sort of Canadian Scunthorpe or Redcar. Not, perhaps a typical opera venue. Alban Berg’s Wozzeck is without doubt a work of genius but it’s also a huge downer from start to finish and that can make it pretty difficult to watch. 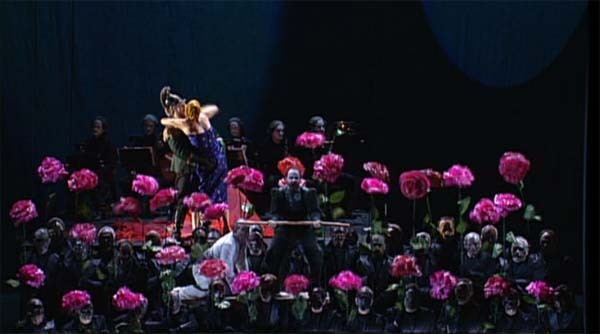 Perhaps the true measure of the 1996 recording from Frankfurter Oper is that it manages to be so consistently visually engaging that the relentless cruelty and horror becomes much more bearable. The production is described as “recorded under studio conditions from the stage of the Frankfurter Oper”. I’m not entirely sure, beyond the absence of an audience, what that means. It looks pretty much like any other DVD filmed from a stage production but maybe some of the scene to scene transitions incorporate non-stage effects. Who knows? Director and designer Peter Mussbach offers us a largely abstract expressionist staging. 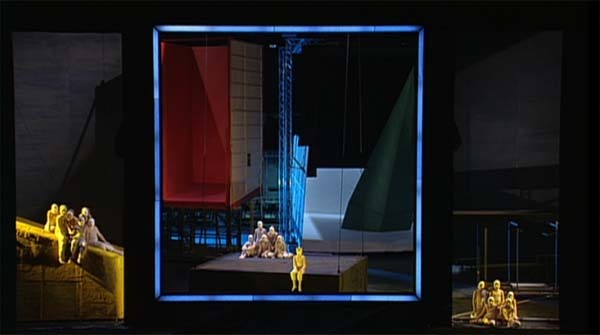 Each scene takes place in a cube at centre stage, framed in neon and populated for the most part by a few shapes in primary colours. Only at the beginning of Act 3, where Wozzeck watches Marie “betray” him with the Drum Major does it just for a moment bend towards a more naturalistic aesthetic. Costumes are similarly stark. The Hauptmann in particular wears something that looks like a red and pink chicken suit with epaulettes whereas Wozzeck is dressed in a simple white (almost) shirt and trousers. Only the drum major gets the almost realistic over the top military tailoring look. 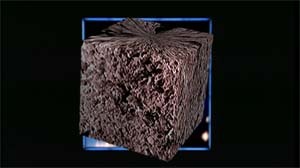 In the transitions between acts a cube filling, well, cube, apparently made of breeze block or cork or some similar textured substance, appears and spins around and does stuff before dropping back to give us a new cube set. 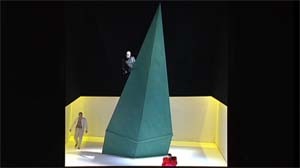 Only right at the end are there characters or scenery outside the cube, albeit grotesquely masked children, as the camera pulls back to reveal the whole artifice of the stage machinery. It’s hard to describe but it does work rather well. The singing and acting are very good indeed. Dale Duesing gives a horrifically convincing performance as the mentally tortured Wozzeck while remaining absolutely vocally secure and even lyrical on the odd occasion he has the chance. Kristine Ciesinski is equally affecting as Marie. Dieter Bundschuh’s Captain and Frode Olsen’s Doctor are well over the top but that’s clearly what the production calls for. The acting is as stylized as the sets. Ronald Hamilton’s Drum Major is a seething mass of testosterone (is there a more unpleasant character in all of opera?). Barry Banks, as Andres, comes close to bringing a touch of sanity to proceedings and is lovely to listen to. Sylvain Cambreling conducts and is quite satisfactory. No video director is credited so I assume Mussbach took on that role. He uses a lot of close ups but given how stark the sets are and how little is going on apart from the main characters that seems perfectly reasonable. The only place it becomes problematic is in the last scene of act 2 where there is quite a lot going on including puppet doubles for Marie and the Drum Major and a cart load of musicians. I would like to see more of the overall picture here. Small caveats aside it all works pretty well as a film. The DVD package is pretty basic. The picture is a decent quality 16:9 anamorphic. The only sound option is Dolby 2.0. The only subtitles are English and they are huge; at least twice the size they need to be, and quite intrusive. The only documentation is a chapter listing.